Isn’t it a total hassle to buy an air purifier in China, especially for expats? Back in places like the USA, when we shop for anything we can luxuriously research using consumer magazines and other review sources, wisely shopping around online and in stores as educated consumers. Here, many of us struggle with Chinese so are at a loss on local shopping websites, forcing us to rely on word of mouth and a tiny handful of imported brand stores. This usually has meant that many of us end up buying the same legacy brands, usually quite reputable but also usually at incredibly marked up prices. Even if fluent in Chinese it’s still very difficult to research credible data. It’s a classic Economics 101 example of information asymmetry, where the typical consumer doesn’t have all the information that they need to properly research the marketplace, thus giving too much leverage to the seller — leading to a very unbalanced supply and demand curve where we pay much more than we should, for a machine that may not be exactly what we needed. So in my continuing efforts to educate people about healthy living in China and elsewhere, I’ve written a basic how-to guide to buying an air purifier, similar to my pollution mask buyer’s guide. I won’t be discussing the need to buy one, as I’ve made it blindingly obvious in many other articles that an air purifier is essential for anyone living here, especially children. Seal your windows and doors! I suggest that anyone with a villa, large home or a business should think about saving some time and possibly a lot of money first by hiring an environmental consultant to assess your site. You may think famous Brand X air purifier is great — but do you need one, two, three or more? And can you get equal benefits from a much cheaper model? And which speed setting do you need to use for general use? Let them figure out all the complicated cubic meters and assess how much machine(s) you need. They also do a great job looking for — and fixing — air leaks around windows and doors (which is cheap and effective advice for everyone, even in your one-window tiny dorm room). They also are experts on the brands of machines available. They should also come back for free for a specified time and double-check that all is OK. I’ve personally used two such companies, both run by expats: Environment Assured, which aim to get your indoor PM2.5 concentration under 10 ug/m3 (the WHO standard, and my goal at home), and also PureLiving China, whose indoor goals for PM2.5 follow the higher Chinese target of 35 ug/m3. I’m sure there are other companies out there, as this surely should be a booming industry. I personally think the evidence is overwhelming that your goal should be to keep your indoor PM2.5 under 10 ug/m3 all the time — even when the outside air is crazy bad. It can be done, and it doesn’t have to be as expensive as you fear. First, measure your room and get the area of your floor space, in square meters. For example, my dining room, living room and long hallway are collectively 84 square meters (“84 m2”). You could be done already! Now you could just check the ads for the recommended room size (适用面积) and do the math. For example, I need 84 m2 of protection — a very large area. I don’t see any single machine rated that high but I see a few in the 40-70 m2 range. So in theory, two machines rated for 61 m2, with a combined area of 122 m2, should easily take care of my 84 m2. That’s the easiest way — but I actually find it more accurate to use airflow and volume because it factors in the room height. A 20 m2 room with standard 2.6 meter high ceiling will need a lot less machine than the same floor space with cavernous 6 meter high ceilings, as many villa front rooms may need. So let’s do more math! Multiply your room area by the room height. For my front rooms: 84 m2 x 2.5m height = 210 cubic meters (210 m3) volume. Since a proper air purifier needs to replace the entire room air at least five times an hour (5 Air Changes Per Hour, or ACH) to really be effective, you need air purifiers that collectively can cover the volume 5 times. So the total airflow (风机空载风量), or Clean Air Delivery Rate (CADR) you need = room volume x 5. For my front rooms, I need 210 x 5 = 1050 cubic meters per hour (m3/h) CADR. Since no single machine has this much power, I’ll need to buy a few machines. Then you need to research air purifiers’ CADR — but here’s where it gets tricky: the published CADR applies only to max speed which is almost always not the speed you will be using 99% of the time. Most machines’ max speeds are far too noisy for normal use, and the speed you’ll actually be using may have airflow much less than the published CADR. The problem is that it’s hard to find published CADR for the lower speeds. I think as a general rule, you should cut the CADR in half to get a more accurate sense of how much coverage you’ll get. Model A on max setting (5) = 783 m3/h. So I would need 1050/783 = 1.34 machines needed. Model A on default setting (3) = 285 m3/h; 1050/285 = 3.7 machines needed. Thus I could conclude that 2 Model A machines may be the most efficient choice for my needs, compared to 2 Model B machines, especially when it’s crazy bad outside and I want to crank up the machines to max speed for a few minutes. On the usual settings I would need an equal amount of machines, but they’re both equally expensive so I’d just start with two of Model A, take some data for a while with my Dylos, and see whether I need to buy a third one. Thus armed with such information for your own rooms, now you can properly research which machines may be best for your needs. Generally you’d want a higher airflow than you really need, so you can use the machine at a quieter level and still get effective airflow. Or maybe two smaller machines combined would still be a better value than one more expensive machine. Step 2: How Much Budget? Not everyone can afford 12,000 RMB ($2,000 USD) for an air purifier, and the wonderful news is that nobody should be paying such exorbitant prices. Certainly when I arrived in Beijing eight years ago those very few early entry, imported brands served an invaluable service for expats and others. But now, there are many reputable brands making perfectly fine HEPA filters in China at a far more reasonable price point. For example, I’m pretty sure almost every student in China could sacrifice a few days of their Starbucks latte and buy the 200 RMB do-it-yourself air purifier. I also just published my own data proving that a slew of air purifiers under 1,000 RMB are perfectly fine for smaller rooms. I’ve tested most of the expat-famous imported models and yes, many are quite good, but I wouldn’t call most of them a good value for the money — not anymore. For example, here is a list from JD.com of HEPA machines under 3,000 RMB which are rated for room sizes over 50 m2, including models from famous international brands such as Westinghouse, Philips, and Panasonic. In terms of features (工作原理), I strongly feel that you do not need ions (负离子) or ozone (臭氧) which actually can cause more lung harm than help — especially in the cheaper machines. Even UV lights (UV灯) are a bit gimmicky. I also don’t care much about killing bacteria (杀菌) and in my home formaldehyde (除甲醛) isn’t a big problem. 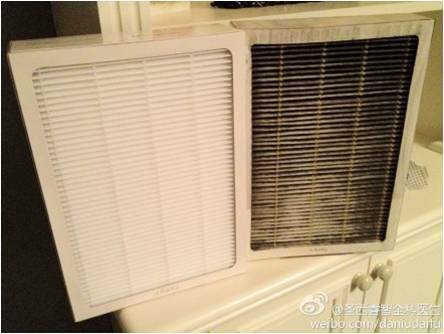 Really, all you need is an awesome HEPA filter which clearly mentions it eliminates >99% of particles (过滤灰尘/花粉 (0.3 微米)), plus a strong fan speed which reflects in a high airflow/CADR. My second rank would be an activated charcoal filter (活性炭 滤网) which absorbs the sometimes serious indoor gases called VOCs, especially formaldehyde (甲醛) and benzene (甲苯). In terms of independent reviews, English readers should definitely start with consumersearch.com, which collects the most reputable reviews from multiple review sites such as Consumer Reports as well as reputable independent testers and also consumer reviews from Amazon. But this is limited data for us in China as many of the brands aren’t the same here. I dearly hope there’s a Chinese version of such a useful site for Chinese consumers! In the meantime, I’m aware of a couple of independent reviews in China which I’ve blogged about here; I also found another Chinese-only review here. 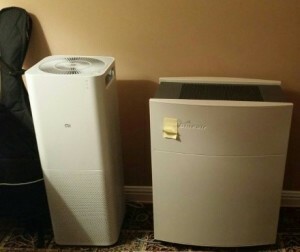 For other China-specific reviewers, I’ve blogged quite extensively about air purifiers and have reviewed many, which you can read here. 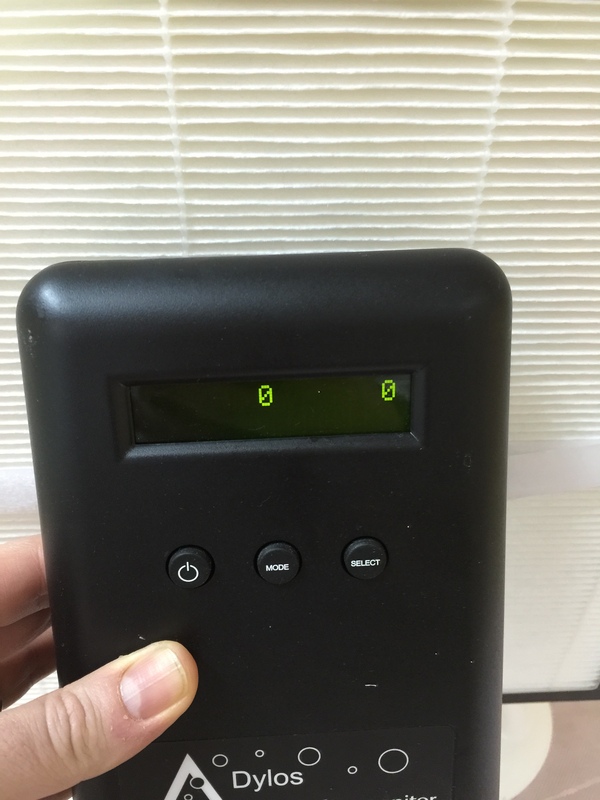 My other favorite tests are from Thomas Talhelm, the creator of the 200 RMB Smart Air filter who also has extensive tests on his blog here. The next level of research are the online shopping stores. Each model is overwhelming you with pretty pictures and a hard sales pitch, but it’s here that you’ll find the details of CADR, filters, room sizes, and extras such as carbon, formaldehyde, etc. In China, online shopping has quickly become the most efficient way to buy almost anything, including air purifiers (空气净化器). 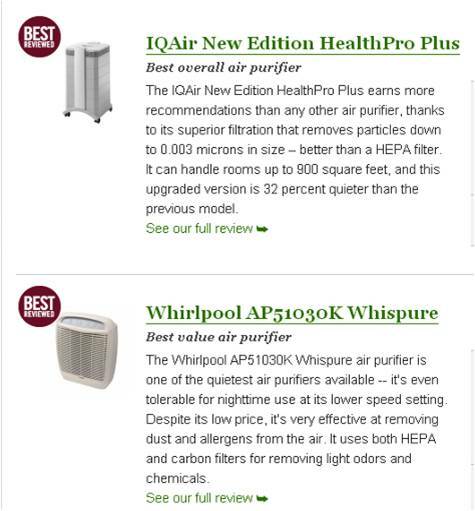 I recommend starting with Amazon China’s Clean Air Store, partly because on the left hand side you can instantly filter by square meters, price and features like HEPA. Also, for most English-speaking expats the Amazon store is much easier to use and very familiar to the USA version; they even have an English interface. My second choice online store would be Jingdong (JD.com), especially if you click on their own distribution brands (京东配送); they also have excellent filter options. My last choices would be Taobao and Tmall. Of course there are retail stores as well but for research and convenience, not to mention price, online is great. What good is spending all this money on machines if your indoor PM2.5 still isn’t under the goal 10 ug/m3 all the time? I’ve saved a huge amount of money and also know that my indoor air is clean because I invested a bit in a portable particle monitor. There are many brands but my favorite is the Dylos 1700, which also seems to be developing a fan club in China, led by the helpful FAQ on the fantastic website aqicn.org. Apparently you can buy online on Chinese sites but it’s cheaper (and probably safer) to get in the USA directly from them or Amazon. I hear that a lot of groups are pitching in to buy one and share, which is a terrific idea. The goal with this Dylos is to get the data on the left side of the screen (PM0.5 but actually more represents PM2.5) always under 3,000, which correlates to an AQI of 50 (which itself means PM2.5 concentration under 12 ug/m3). It’s quite shocking just how many people buy machines and actually forget to change the filters, essentially making them totally ineffective if the filters get too clogged. It’s not only crucial to replace the filters on time (all machine replacement schedules are different), it’s also helpful to frequently wipe or vacuum the outside of the machine to get dust off the prefilters. I’ve had a Blueair for a long time — and totally forgot about the plastic prefilter screen underneath the machine, which was totally clogged with dirt and I’m sure was dramatically lowering the airflow. That was embarrassing! There simply is no longer any good excuse for anybody in China, even those with limited resources, not to protect themselves with an indoor air purifier. I hope I’ve provided some helpful information for you to make informed decisions. Thanks for emphasizing the importance of choosing the correct evidence-based targets for safe and healthy air. Most people don’t realize that the Chinese 35 µg/m3 PM2.5 level is actually associated with a 15% higher long-term mortality risk relative to the proper WHO guideline of <10 µg/m3. Since <10 µg/m3 is achievable with minimal cost difference, then 35 µg/m3 really should not be considered a goal. By definition it certainly is neither safe nor healthy. Completely agree that safe air is achievable without buying the most expensive filters. We have achieved 10 µg/m3 with Smart Air filters and monthly cartridge changes. It's just a matter of balancing cost and convenience (noise, need to constantly adjust filter speeds) and making sure the indoor space has been prepared as necessary. Great site and comparisons – it’s clear you do your research and put a lot of hard work into it at that. I’m looking to purchase an air purifier for California — any suggestions on top rated when you live in the states? If you have done a write on the past, I’d be interested in reviewing/reading it… thanks!! Sorry…just now clicking on the other links and I found a few for here in Cali. Thanks again! Hi! I have read a lot of your articles and find them pretty helpful and informative. I currently live in the US and I plan on studying abroad in China, Hong Kong for 4months (Sept – Dec). I was reading an article about the air quality is good during those months and at its worst when the winter comes. Do you think it is necessary for me to purchase an air purifier? If so, what would you reccomend on a college student budget? Xiaomi has only one model (for now). And their machine doesn’t have an ionizer function so there’s no ozone smell.